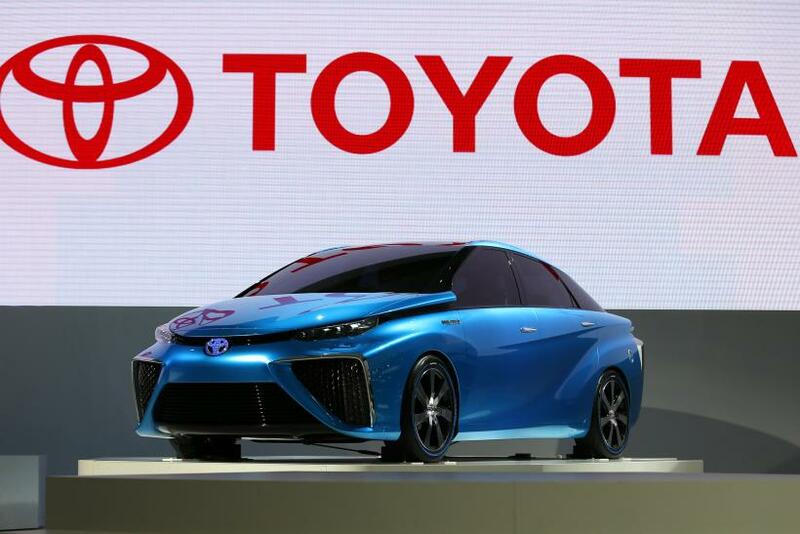 Toyota Motor Corp. (TYO:7203), the world’s top automaker, grabbed the spotlight on the first day of the 2013 Tokyo Motor Show Wednesday by telling the world it's ready to mass-produce a hydrogen fuel cell car by 2015 locally and a year later globally. 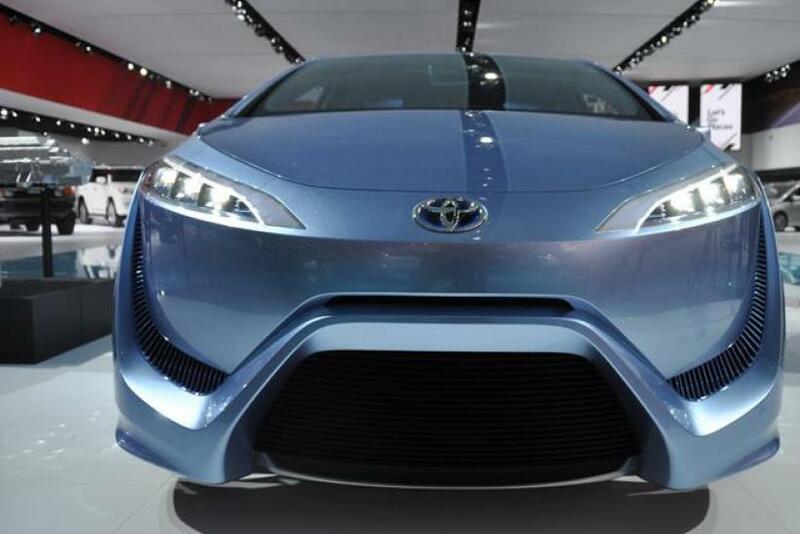 Toyota is one of 32 car and motorcycle manufacturers showing off their wares this year, with a strong emphasis on eco-friendliness from our mechanical steeds. 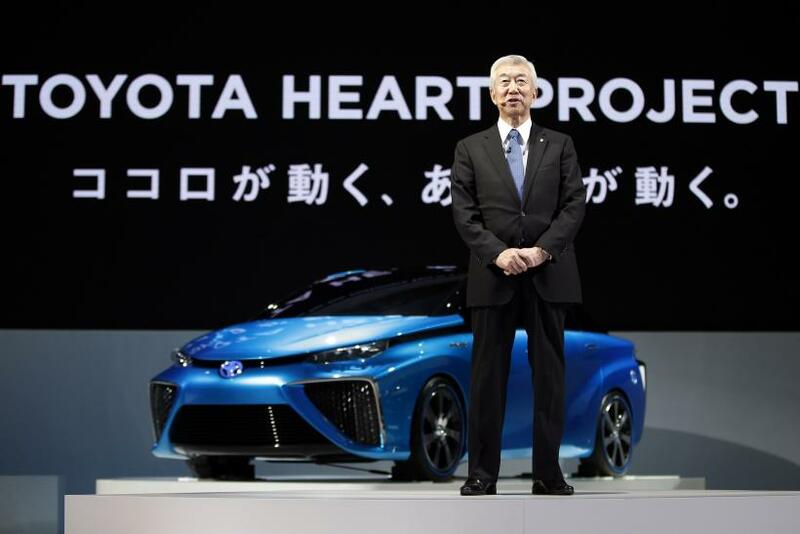 Executive Vice President Mitsuhisa Kato presented the latest iteration of the fuel cell vehicle that Toyota has been kicking around recent auto shows. It looks more refined than the shell of the car seen in Detroit in January, where the engine compartment was being used to store expo brochures and only a model of the car’s fuel cell engine was on display separately. The vehicle on display in Tokyo couldn’t have been driven off the stage either, but it clearly looks more ready for that than previous iterations. Many inside and outside of the industry still see hydrogen fuel cell technology as nowhere near ready for prime time two years from now, if ever. A lot of things have to happen before an HFC vehicle could be driven around with even the restrictive ranges and routes of current electric vehicles on the market. And despite nearly 15 years of work by Honda Motor Co. (TYO:7267) and its Fuel Cell eXperimental project, today an FCX Clarity (think: zero-emission Honda Civic that costs more than souped-up zero-emission Tesla Model S sedan) is as likely to be seen on a U.S. highway as a horse and buggy. One of the biggest hurdles in hydrogen fuel cell technology is simply building out the infrastructure that would allow owners of these cars to refuel wherever they travel with them. 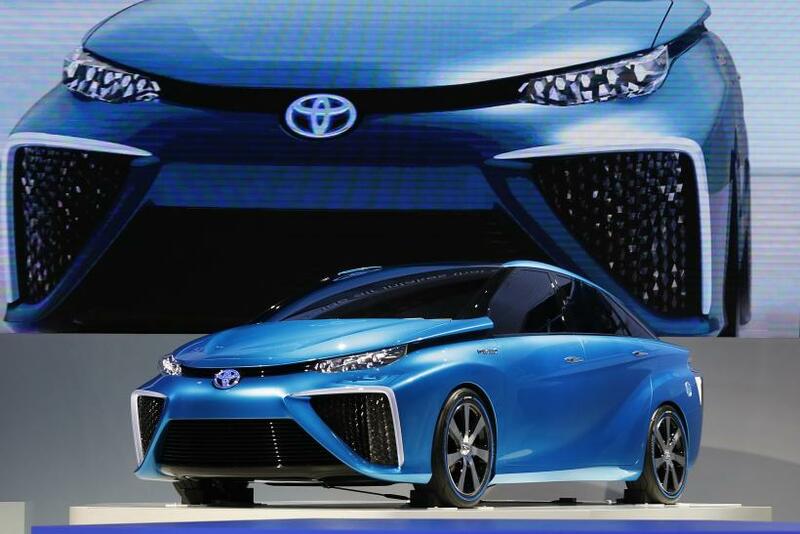 The other problem is cost – Toyota says its FCV would be priced between $50,000 and $100,000, hardly a bargain, especially for a car that appears to be heading for entry-level luxury at best. And thirdly, HFC would probably face much of the same scrutiny Tesla Motors Inc. (NASDAQ:TSLA) is currently facing – justified or not. If the image of flaming lithium-ion batteries is causing some stock-pummeling jitters for Tesla, imagine what an exploding tank of compressed hydrogen gas would cause. Honda, which led the way in the push for HFC back in 1999, hasn’t given up. 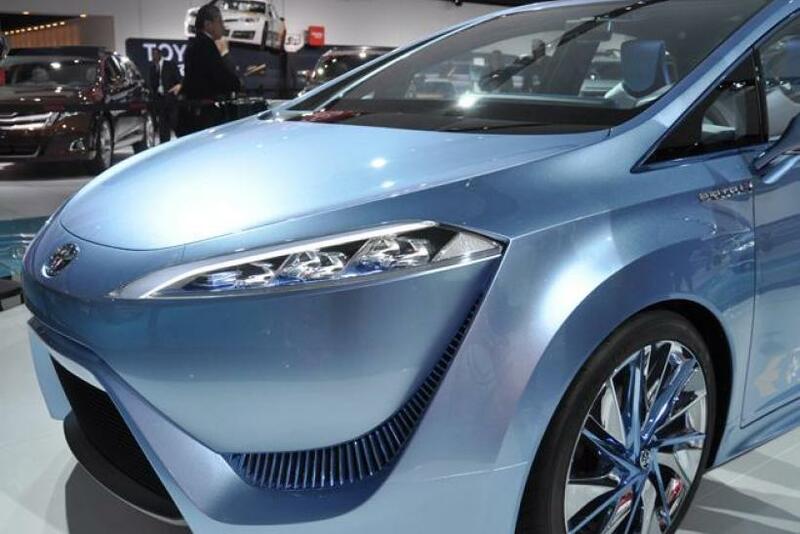 It too is talking hydrogen in both Tokyo and at the L.A. Auto Show that’s happening at the same time, and it is promising an HFC car by 2015 based on the concept car it’s unveiling this week. Joining Toyota and Honda on the HFC bandwagon is Hyundai Motor Co. (KRX:005380) which says it will soon unveil its own HFC car. "The fuel cell solution … sort of brings together the best features of [internal combustion engines] and the best features of battery electric vehicles," Hyundai North America CEO John Krafcik recently told reporters. "It is very compelling. It has great range. I can refill it in almost no time, and it is not impacted by weather,” he added, referring to the issue of electric-car batteries losing range in cold weather. But count Carlos Ghosn unimpressed. Speaking to auto reporters in Tokyo on Wednesday, the 59-year-old Brazilian-born French-Lebanese head of Nissan Motor Co. Ltd. (TYO:7201) and Renault SA (EPA:RNO) pointed out one obvious problem with these plans to roll out HFC cars within two years. Tesla’s answer has been to build out its own network of electric quick charge stations. Utilities in places where EVs are popular are beginning to offer EV charging plans similar to mobile phone contracts, and some municipalities are taking the initiative to promote charging networks, especially for public vehicles. Ghosn joins Tesla CEO Elon Musk in poo-pooing the idea of hydrogen fuel cell passenger cars. On a visit to London late last month Musk called HFC cars “bull****,” accusing automakers of exploring HFC as a marketing gimmick. The problem Musk sees is more fundamental than Ghosn’s structural complaint. Ghosn doesn’t see HFC coming as quickly as Toyota and Honda see it, due to the gaping lack of infrastructure. Musk, on the other hand, doesn’t see HFC coming at all, because he insists the fuel is too volatile. “Hydrogen is suitable for the upper stage of rockets, but not for cars,” Musk said at an event promoting his Model S luxury electric sedan late last month. But then, both of these men have placed high bets on EVs. Nissan currently manufactures the Leaf five-door compact, the best-selling passenger EV in history, with a current range of about 80 miles from an 80-kW electric motor. At the L.A. Auto Show on Wednesday, Nissan said it plans to boost U.S. production of the Leaf, which is produced for the local market at Nissan’s publicly supported manufacturing in Smyrna, Tenn., due to robust demand. The Leaf, which debuted in 2010, is still a low-volume seller, but U.S. deliveries spiked 166 percent to 18,078 units from January to October. Nissan sold its 100,000th Leaf this summer. Meanwhile in Europe, Nissan’s sister company Renault is moving forward with a line of EVs ranging from the itty-bitty Twizy to the Fluence Z.E. four-door compact. Betting so much on electrics, Nissan and Tesla both have reasons other than the infrastructural and technological viability of HFC to dismiss efforts by Toyota, Hyundai, Honda and General Motors Co. (NYSE:GM) – which recently joined the U.S. Army in researching the technology – to explore the potential market for HFC.